A continuation of the so called case study. The power of the EUR/USD bear is still unimpaired, and its eye is focus in the 1.2865 target area. 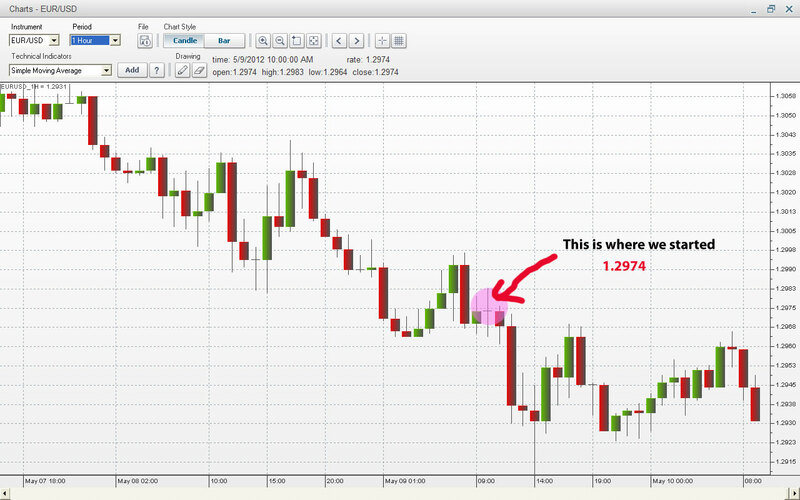 As I write this, the price is at 1.2930, so that’s already a 34pips earning, there is still no sign of reversing the trend according to the news and the chart. Look at the chart below, it seems that it also forms a doji in a one hour chart (1H) to the time where we bought short the bloc pair. There are still a pretty constant lower highs and lows. Not much going on in US and no breaking news in EU too. We’ll see how the coming events in Euro and US will affect our earnings. It seems that the bounce at the 1.2911 is corrective and it ranged around 1.2925 to 1.2935. The resistance at 1.2962 is strong, makes me a bit confident that we are not going to have negative profit at the end of the week. Next update tomorrow… Stay tuned!